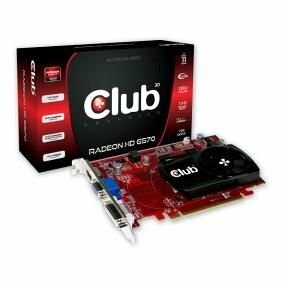 Club 3D B.V. announces the introduction of the AMD Radeon HD 6570 video card based on the Turks PRO chipset, AMD’ second generation DirectX 11. The Club 3D Radeon HD 6570 1 GB DDR3 video card features now the AMD HD3D technology which allows you to have faster access to multimedia applications and gives you all tools to enhanced productivity. Furthermore you can enjoy the latest 3D Blu-Ray movies with EyeSpeed technology. The new card comes equipped with a nice single slot cooler which makes you enjoy your new video card without compromising on your perfect computing environment.